Most gay and bisexual men are not aware of current treatment recommendations for those who are HIV-positive, or of the latest developments in reducing new infections. Only about a quarter (26 percent) know about PrEP (pre-exposure prophylaxis), a recently approved prescription medication that people who are HIV-negative can take to lower their risk of becoming infected (this is somewhat higher than the general public, 14 percent). Three in ten (31 percent) believe no such medication exists, and over four in ten (43 percent) say they don’t know. Further, only a quarter (25 percent) of gay and bisexual men know that if someone with HIV is taking consistent ARV treatment, it significantly reduces the risk of passing on HIV to their sexual partners (about the same as the general public, 21 percent). 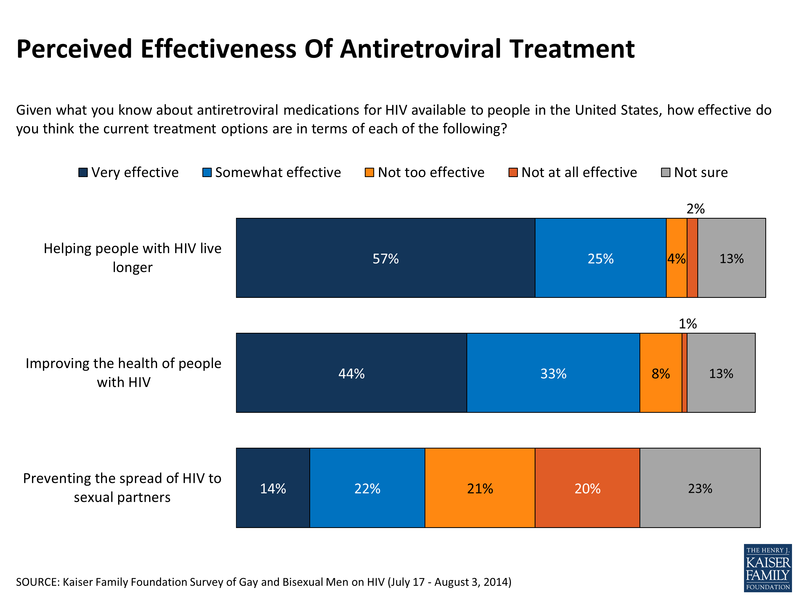 A plurality (39 percent) believe that consistent ARV treatment does not reduce the risk of transmission, and over a third (36 percent) say they don’t know enough to answer. Men who identify as gay are more likely than those who consider themselves bisexual to be aware that taking consistent ARV reduces the risk of transmission (29 percent versus 15 percent), and that there is a prescription medicine HIV-negative people can take to lower their risk (32 percent versus 15 percent). As noted above, just a quarter of gay and bisexual men know that a medication exists to reduce a person’s risk of contracting HIV. 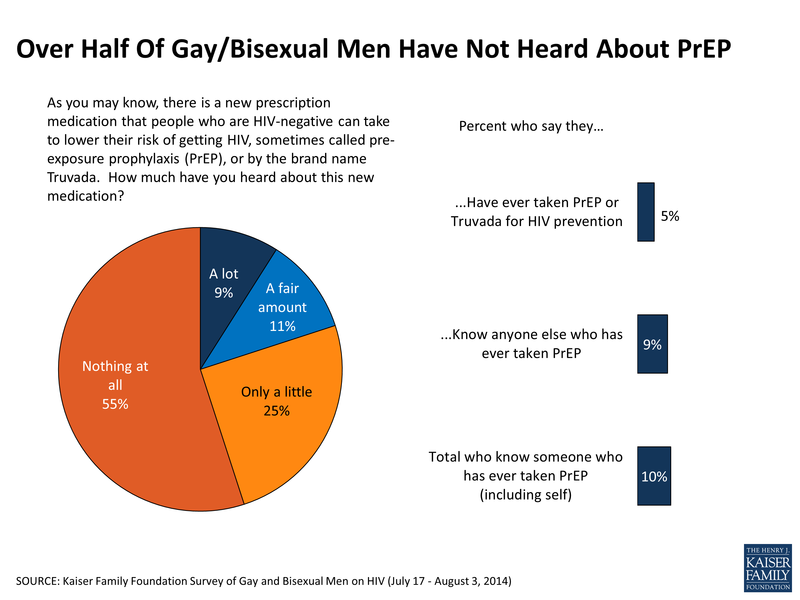 In a more specific question that mentions both the term pre-exposure prophylaxis (PrEP) and the brand name Truvada, just one in five say they have heard “a lot” (9 percent) or “a fair amount” (11 percent) about this new medication. One-quarter say they have heard “only a little” about PrEP, while over half (55 percent) say they’ve heard “nothing at all.” Just one in ten say they personally know someone who has taken PrEP for HIV prevention, including 5 percent who say they have taken the medication themselves. 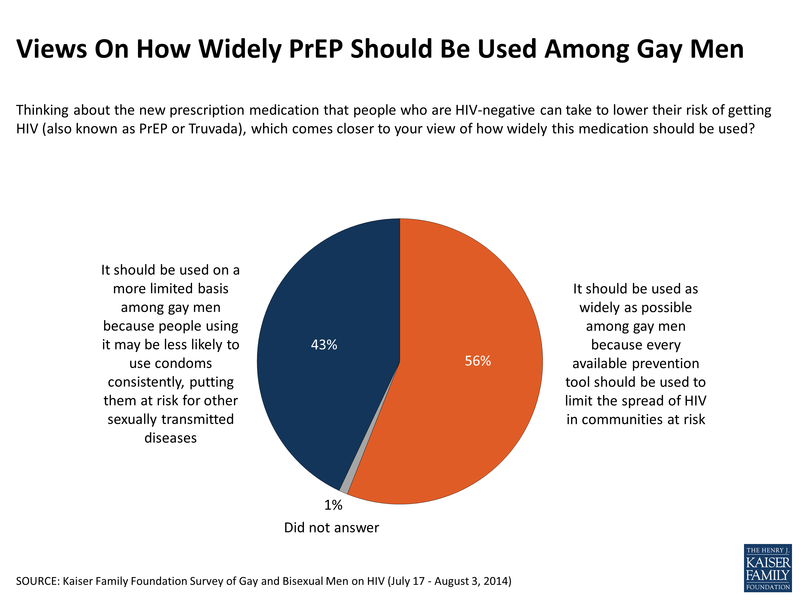 Gay and bisexual men ages 35 and older are more likely to support widespread use of PrEP (64 percent say it should be used widely and 35 percent think it should be used on a more limited basis), while those under age 35 lean in the other direction (56 percent say it should be used on a more limited basis and 43 percent think it should be used as widely as possible).